Rahul Gandhi in Ajmer: Congress president Rahul Gandhi on Thursday addressed a gathering at AICC Sev Dal convention in Rajasthan's Ajmer and sent a message of 'love' to Prime Minister Narendra Modi on Valentine's Day. 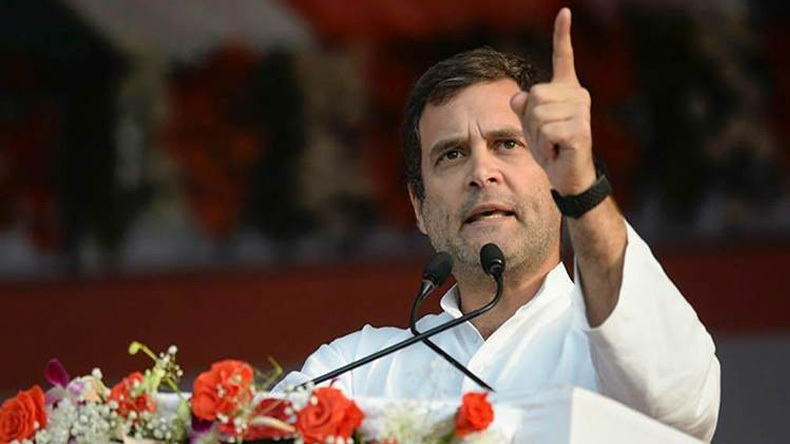 Rahul Gandhi in Ajmer: Congress president Rahul Gandhi on Thursday addressed a gathering at AICC Sev Dal convention in Rajasthan’s Ajmer and sent a message of ‘love’ to Prime Minister Narendra Modi on Valentine’s Day. Rahul Gandhi told his party workers that they can’t fight the BJP’s hate with hate and to fight the hatred of the BJP and the RSS with love. The Congress scion said he hugged PM Modi in Lok Sabha despite the fact that he insults him, his family, and the Congress party. On Wednesday, PM Modi took a jibe at Rahul Gandhi’s act of hugging him during his last address in the 16th Lok Sabha before national polls – due by May. In Rajasthan where the Congress party recently established its government-led by Ashok Gehlot, the Congress president said PM Narendra Modi had promised loan waivers to farmers, but he wrote off bank dues of industrialist-friends. He further said the Congress government waived off farms loans in Rajasthan, Karnataka, Madhya Pradesh, Chhattisgarh and Punjab, whereas Modi government wrote off loans of Anil Ambani, Nirav Modi and Mehul Choksi. Lok Sabha 2019 polls will be a battle between the ideologies of the Congress and the BJP-RSS, he said. Later in the day, Rahul Gandhi will launch the Lok Sabha campaign for his party in PM Modi’s home state Gujarat.